Today is a significant day in history. Today is the birthday of not one, but two American historical figures: a legendary military general and an alcoholic heroin addict. Sorry, I mean Robert E. Lee and Edgar Allen Poe. Now, as an English major and writer (sort of), you might expect that I would be talking today about Edgar Allen Poe and his lasting influence on American literature. And, to be sure, his contributions to the artform were significant. But this morning, when I woke up and was browsing through the notifications on my phone (what? isn't that what you do first thing after you wake up?) I saw one of my favorite news website's headlines: "Today in 1807, future Confederate General/Traitor Robert E. Lee was born." Man, nothing gets you out of bed like an adrenaline-filled shock of indignation. Traitor? Really?? Strap in, cause we're going to take a little walk through history today. I really hope you stay for this one, because this is a subject near and dear to my heart. First, let's clear up a couple of common misunderstandings. Primarily, the War begun in 1861 by the Federal Government was not a "Civil War." A "Civil War" is strictly defined as a war in which two or more groups battle for control of the centralized government. This was not the case. The South had no interest in taking over Washington DC. They wanted to secede, to pull out, and be left alone. So the more technically correct term would be "The War Between the States," which is how I refer to it. Second, the Confederate Army wasn't fighting to preserve slavery, like we have been taught for the last 150 years - proving the adage that the winning side writes the history books. I can only imagine how appalled the former slaves and free blacks such as Richard Quarls who fought in the Confederate Army would be to hear that accusation today. Historian Shelby Foote tells how Yankee soldiers asked a starving, barefoot Confederate soldier they had captured - obviously too poor to be a slave owner - why he was fighting in the war if he didn't have slaves. His answer? "Because you're down here." This wasn't a war only or even primarily about slavery. But more on that later. The South holds claim to America's military heritage. A disproportionate number of decorated servicemen from WWI, WWII, and subsequent wars are from the south. The majority of military bases in the US are named for Southerners, such as Bragg, Benning, Hood, Polk and Rucker. As Ann Coulter said, if America really had a class system, the South would be our Warrior Class. As for Robert E. Lee, he's one of the greatest military figures in our country's history. In fact, before the War had begun, his reputation was such that Abraham Lincoln asked him to come and lead - lead - the Yankee army in their conquest of the South. Now, certainly, part of that was political, since the effect of having a Southern general leading an invading army into the South would be significant on the psyche of the Southerners. But largely it was because already Lee's skill as a military man was well-known. Indeed, no general of the day, including future president Ulysses S. Grant, could match him when it came to tactical prowess. Lee took a full night and day to consider the decision. He respected Lincoln as Commander-in-Chief, but he loved his homeland of Virginia, one of Lincoln's military targets. Was he to join in fighting against his friends and neighbors, seeing the state he loved razed and pillaged as in Sherman's famous march? Lee wasn't a supporter of slavery. He freed his own slaves before the War. Ultimately, he resigned his commission as an officer in the US Army to join the Confederacy in protecting his homeland and his friends and family. Context is everything. Consider yourself in Lee's position. Imagine that President Obama (who I'm only using because he's the current sitting President, don't jump down my throat here) Imagine President Obama called you - or your husband - and asked him to come be the new Commanding General of the Army, with the expressed mission of marching on and fighting your hometown, your neighborhood, where your friends and family lived and would be fighting against you, requiring you to fight them, injuring and killing them, taking their homes and personal belongings as war trophies. That's what Lincoln was asking Lee to do. 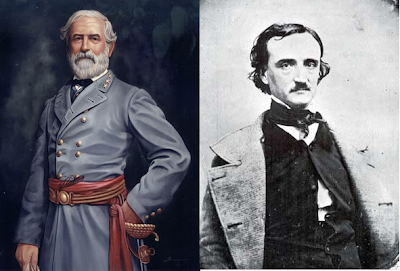 Respecting your August 1 inquiry calling attention to my often expressed admiration for General Robert E. Lee, I would say, first, that we need to understand that at the time of the War Between the States [see? he calls it that, too.] the issue of Secession had remained unresolved for more than 70 years. Men of probity, character, public standing and unquestioned loyalty, both North and South, had disagreed over this issue as a matter of principle from the day our Constitution was adopted. Lee had this to say about his service in the War: "I did only what my duty demanded. I could have taken no other course without dishonesty. And if it were all to be done over again, I should act in precisely the same manner." He also said, "I surrendered as much to Lincoln's goodness as I did to Grant's armies." Even after disagreeing with Lincoln on the War, he still loved his country and respected his President. When news came to Lincoln that Lee had surrendered, Lincoln asked the White House band to play "Dixie" as he announced the end of the War. Later, when he became President of then Washington College (now Washington and Lee University), located in Virginia, Lee allowed no one to speak against General Grant. The two men greatly respected each other until their deaths years after the War. Winston Churchill described the War Between the States as "the last war fought between gentlemen." Lee was unmistakably one of those gentlemen. That's a man whose legacy I can celebrate today. Poe wrote some really good poems. Feel free to name your favorite one in the comments. I love this post!! I think I've told you before that the way the "Civil War" was presented to me in my (just north of the Ohio River) school as the North fighting for what was right and the South basically fighting to keep their slaves and be trashy. The way it was taught made us feel proud to live in the North, "the right side," and until LAST YEAR I hadn't questioned it. I had some extremely liberal social studies teachers in middle school, needless to say!! I grew up in the both the north and south (moved to the south in 8th grade) so I had the pleasure of getting taught about the "Civil War" both ways. Firs that the south was evil and trashy and then more of the way you presented it. Then I was a history major in undergrad, and I took a class literally called "The War Between the States." It was great, and was definitely presented fairly and not just "The north was right." I still think it's funny when southerners call it "The War of Northern Aggression" though. As a major Civil War buff, let me say this: bravo! Agreed with this entire post 100%. fantastic post!! I hate how the war of northern aggression (hehe) has been taught to me in schools. or almost all history for that matter. it has always been unbelievably skewed, and usually leans very left. ugh. and one of my favorite poems is Annabel Lee. I LOVE edgar allan poe! I'm deleting the above comment. I don't tolerate trolls. Take your hate elsewhere. I love civil war history... Have you read any of the Shaara books? Love this post! I basically picked my minor in undergrad (history) just because I love learning about the War Between the States! I had some pretty awesome professors that presented the material without bias. People hate getting into discussions about The War Between the States with me. I did my senior history thesis in high school on Sherman and the war crimes he committed. It was enough to make me sick after I did all the research. People do not realize that it was a primarily economic war in which the south realized they were being treated unfairly by the north and chose to become their own country to have control over their agricultural economy. It is a very misunderstood period in our nations history and is grossly misrepresented in text books. I had an amazing teacher that taught our Georgia history class and made sure we understood all sides of the war.